A rehearsal dinner is a pre-wedding ceremony, typically held immediately after the ceremony rehearsal. The guests are usually the bride, the groom, the bridal party, and close friends (particularly those who will play a part in the wedding ceremony). The Rehearsal Dinner provides the bride and groom a chance to say thank you to those who participated in the wedding preparations and give everyone a chance to meet before the wedding day. You just finished your rehearsal for the ceremony and it is 5:00. You don't want a heavy meal, but you want to give your guests some type of meal. You want to keep it casual with a lot of conversations. Maybe a light appetizer menu is perfect for you. We can do a variety of 8-10 passed hors d'oeuvres for an hour and a half, and a stationary table. The stationary table would be a bunch of different cheeses, pita chips, hummus, black bean dips, crudité and fresh fruit. Hors d'oeouvres would be stuff like mini crab cakes, shrimp and margarita shooters, arrancini, etc. For dessert, fresh fruit, mini pastries, coffee and herbal teas. Keep it light and simple. Rehearsal dinners are about families conversing, catching up and in some cases meeting for the first time. Maybe you want to keep everyone at the table and serve dinner like you would Thanksgiving Day…where all the food is on the table and you pass the dishes around on antique style platters. Maybe the first place you met was at a backyard BBQ and you are thinking you want your rehearsal dinner to reflect this. We can do corn on the Cobb, country fried steak, and black bean salad. Or maybe you fell in love in Ireland and you want to have lamb stew, or Irish whiskey bar. Or maybe your fiancé is Indian and you want to incorporate Indian flavors like masala into your dishes. Whatever you decide make it your own. Get your guests into the wedding mode. Make it fun by creating a story behind it. Most importantly, everyone should turn in early. Everyone should get a good night sleep before the BIG DAY! Lola's Cafe wanted to share a few menu ideas for your rehearsal dinner. We provide a customized menu for every event that we do. We cook locally and fresh. 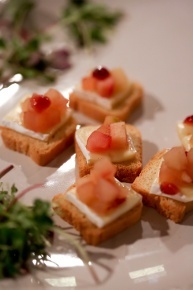 Call us today at 845-471-8555 if you would like to discuss ideas for your Rehearsal Dinner!